Border crossing days have a different rhythm. An early start and a group ride to the border. This morning's was a slow procession at first with dense fog at the top of the pass cutting visibility to as low as 10m in places. 1. Get a pass into the compound using your V5 to prove your vehicle registration. 2. Passport stamped with çikis (exit) stamp. 3. Customs look at V5 and passport and compare to computer to see that the same person is exporting the bike as imported it. 4. Present V5 to exit compound. 20 minutes and we were at the Georgian border where a young man with very good English typed passport and V5 details into a computer (provided by the US Dept of Homeland Security - go figure) and we were through. Ten minutes. Crossing the border changed everything. Crosses instead if crescents. High heels not headscarves. Steep sided wooded valleys after high grasslands. Gone too are the four lane playgrounds. We actually had to overtake lorries by waiting for a gap in the oncoming traffic for the first time in a week. Mind you, Georgian drivers don't always bother to wait for a gap. This is go-for-it driving country and a couple of times vehicles just pulled out, trusting that the bikes would squeeze over to give them space. 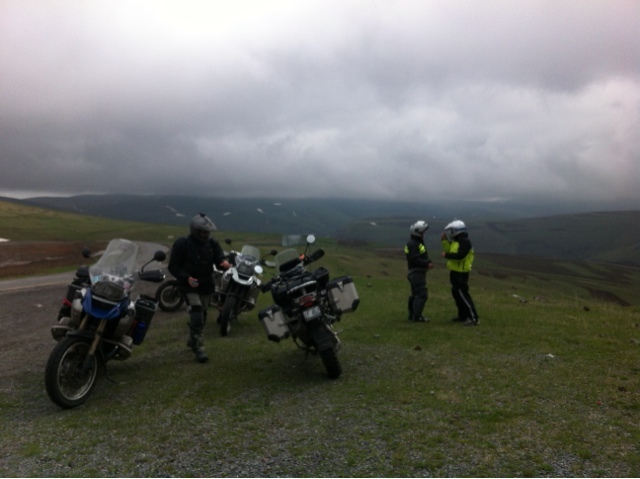 Once we were through the narrow valleys we rode the motorway past Stalin's birthplace of Gori to the capital, Tbilisi. Our hotel is in Freedom Square, right in the centre. We are here for two nights so there is a chance to explore the city tomorrow.